It’s hard to argue that bicycles aren’t super handy. They get you from point A to B in a jiffy with little effort. Since these machines are so simple and convenient, why not use them for things other than transportation? Well, [Job] set out to do just that. [Job’s] starts with a standard single speed bike and adds a few parts. First, a stand is installed to the back axle. When in the down position, it lifts the rear wheel off of the ground and provides support so the bike does not tip over. When flipped up into the ‘up’ position the stand creates a rack for holding goods and the bike can be pedaled around in a normal manner. Next, a jack shaft made from a bike bottom bracket and crank is installed up front in between the top tube and down tube of the frame. On one side of the jack shaft is a sprocket and the other side is a large pulley. When converting to what [Job] calls ‘power production mode’, the chain going to the rear wheel is removed from the crank sprocket and replaced with a chain connected to the jack shaft. With the rear stand down supporting the bike and the pedals now powering the jack shaft and large pulley, it is time to connect the bike to any sort of machine. A belt is slung around the pulley and connected to a matching pulley on a power-hungry machine. 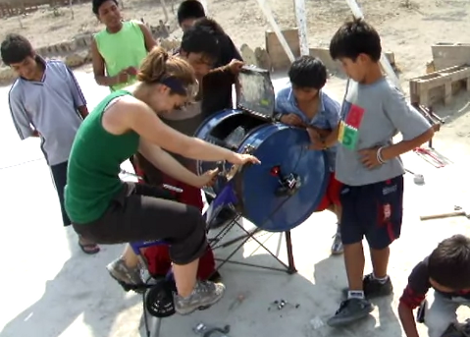 This dual-purpose bike has powered a rice thresher, peanut sheller, water pump, table saw and even a wood lathe! [Job] set out to create a simple and inexpensive way to make a bike even more useful than just riding around town. We think he did just that. For more bike-powered stuff, check out this generator. Remember that this method is only intended to be used in an emergency, not as every day practice. Using these methods could potentially overheat or damage your gear, so be careful. Check out the MacGyver worthy video tutorial after the break. Those of us living in the first world take clean clothes for granted. Throw them in the washing machine, transfer to the dryer after 45 minutes, and you won’t smell for another two weeks or so. But for people living in areas without electricity, clean clothes are a huge amount of work. Hand washing a family’s clothes is estimated at 6 hours per day, three to five days per week. Here’s a post that looks at some of the different human-powered washing machines out there. If you were looking for a washing-machine powered bike instead of a bike-powered washing machine you’ll want to head on over to this post. 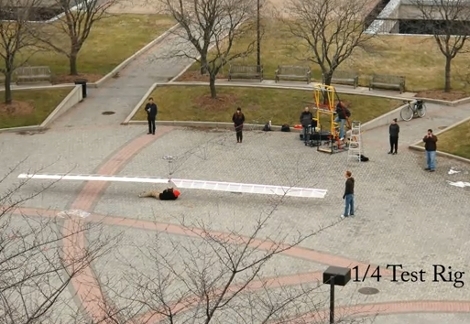 A team from the University of Maryland will be taking their human-powered helicopter to the air tomorrow. The current flight record for this type of vehicle is just over 19 seconds of flight at a height of about 8 feet. What surprises us about this attempt is that they’re not pedaling just one main rotor. It seems that the most success in man-powered helicopter flight has come from helicopters with a total of four rotors. The image seen above is a 2009 test of just one of the four rotor arms that will go into UMD’s finished chopper. Fully assembled it will be about 1/3 the size of a football field, dwarfing the autonomous quadcopters we usually see around here. Get the details about the design from the video after the break. It’s interesting to hear [Dr. Antonio Filipone] talk about the need to generate both the lift and the thrust, where human-powered fixed-wing aircraft only need the thrust. He predicts that human-powered helicopter flight is possible, but that it will only lift the aircraft, with little possibility of moving it in one direction or the other. The team is attempting to grab the $250,000 Sikorsky Prize with their creation. We wish them the best of luck.